Is this the true face of Tut? 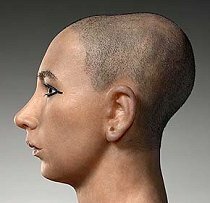 This silicone-skinned bust is billed as the most accurate forensic reconstruction ever of ancient Egypt's Pharaoh Tutankhamun. It was based on recent 3-D CT scans of the mummy of the "boy king," who is believed to have been about 19 when he died some 3,300 years ago. Led by Zahi Hawass, head of Egypt's Supreme Council of Antiquities, a National Geographic Society team commissioned French experts to create the lifelike bust. Using the CT scans, French forensic anthropologist Jean-Noël Vignal determined the basic measurements and features of Tutankhamun's face. Vignal deduced that Tutankhamun had a narrow nose, buck teeth, a receding chin, and Caucasian features. Such features are typical of European, North African, Middle Eastern, and Indian peoples. Paris-based forensic sculptor Elisabeth Daynès then created the bust shown above. She used Vignal's estimates of skin thickness and other data, plus wooden sculptures of Tut made in his youth. Soft-tissue features, such as the nose and ears, had to be guessed at, though within a scientifically determined range. 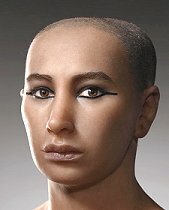 Daynès based the skin tone on an average shade of Egyptians today and added the eyeliner that the king would have worn in life. Finally, National Geographic gave the CT data to a U.S. forensic team, who were to work "blind" — not knowing who the subject was. Their findings validated the French team's conclusions. And their plaster cast, a photo of which will be published on the National Geographic magazine Web site later this month, turned out remarkably similar to the silicon bust. The reconstruction will be featured in the June issue of National Geographic, in the touring exhibit "Tutankhamun and the Golden Age of the Pharaohs," and on the National Geographic Channel's King Tut's Final Secrets, airing Sunday night.